This came from Jill Ball. The answers are mine. 1. An elusive ancestor I found was; none this year but added details to most branches and enjoyed finding out the information. 2. A precious family photo I found was; none but I did scan several, late last year, 2015, at a family get together and talked to the Aunts about them. 3. An ancestor's grave I found was; Henry and Charlotte Vaughan's, at Camperdown Cemetery. The stone is no longer standing but I found them! 4. An important vital record I found was; probate for my husband's maternal Grandmother. Made very interesting reading. 6. A geneasurprise I received was; winning a 2017 pass to RootsTech! 2016, what has happened, this year? Plenty of travel both together and just me. January and we made a trip to Canberra, for my birthday. February and I made my first trip to the USA and attended RootsTech, in Salt Lake City. I was joined by our daughter and together we did Las Vegas, Grand Canyon, San Franciscoand Los Angeles. April, we enjoyed a few days at Windsor and explored the area. May saw us head to Melbourne and family time. September and I attended a conference in Camden. We then flew to Cairns for a family holiday, Fantastic. October and we were of to Adelaide. Family, friends and genealogy made up that trip. December and our Christmas trip to Melbourne. I have continued my study, doing three subjects form the University of Tasmania, as well as my Diploma course with the National Institute of Genealogical Studies. I have nearly finished this course, with just five subjects to go. We have really settled into retirement, finding time to relax and enjoy life. It has been awhile since I last blogged and I'll bring you up to date, with what has gone one. 13th December saw Paul and I head south, to Victoria to spend Christmas with our Victorian family. Something we love doing! We stopped at Euroa, overnight and arrived at our daughter's at 8.00am. A quick change, into warmer clothes and a cuppa were in order. For morning tea we headed to the Flying Tart at Kinglake West. This bakery/café was one of the few places to survive the Black Saturday bushfires. Their bread, pies and tarts are delicious. Always good to support a local small business. The next morning we headed to the Yarra Valley Chocolaterie & ice creamery, for breakfast. Something of a bit of a tradition, when we are there. I did my Christmas chocolate shopping, after a delicious breakfast. Last Saturday saw us at Milawa, the Gourmet Region of North Eastern Victoria. First stop was the Milawa Cheese Factory for lunch and a cheese tasting. This was our lunch view. Beautiful! They have a variety of cheeses and I tasted several, including the Brie. All were delicious. There is also the cellar door for the King Valley Wood Park winery. We tasted a selection and Paul and I added to our collection. A winery to keep an eye on. Our next stop was Brown Brothers Wines. We all enjoyed our wine tasting, with several interesting ones being purchased. I sampled the white wines and Paul sampled the reds, ports and Muscat's. They also sell jams, with wine in them, yes I bought some, to bring home. This is their shop and cellar door. Plenty of space and lovely and cool. Have you really, really looked at your family tree? What do you see? Dates, names, places, yes but anything else????? I know that we only have 365 dates to playwith, have a good look at those dates? What do you see? On just my side we have four generations, with the same birth date.Samuel Galbraith 22 October 1815. His Great-granddaughter, Lilian Galbraith, in 1911. Then follows a great-great granddaughter and a great-great-great grandson. These last two are mother and son! So this happens, so what! Well the 6th December has Mary Ann Grant my husband and my niece. We do have a few doubles as well. The biggest coincidence is that of Arthur Galbraith and Mary Ann Grant. These are my great-grandparents, on my maternal side. What is their coincidence? BOTH Arthur and Mary Ann are the second child to have that name in their generation, in their respective families. The first Arthur was born 1850 and died sometime between 1850/52. My Arthur was born 1852 and died 1894. Friday, 11 August 1933, page 8, Telegraph (Brisbane, Qld: 1872-1947) There were lots of interesting articles, ranging from funny ones, through to obituaries. Bye for now, Lilian. Here are some of the photos I used in my UTAS Photo Essay Assignment. Taken at Camperdown Cemetery. The church is St Stephen's. It was early morning and other than some people walking dogs, I had the place to myself. It was lovely and quite. Copyright 2016 LH Magill. All rights reserved. 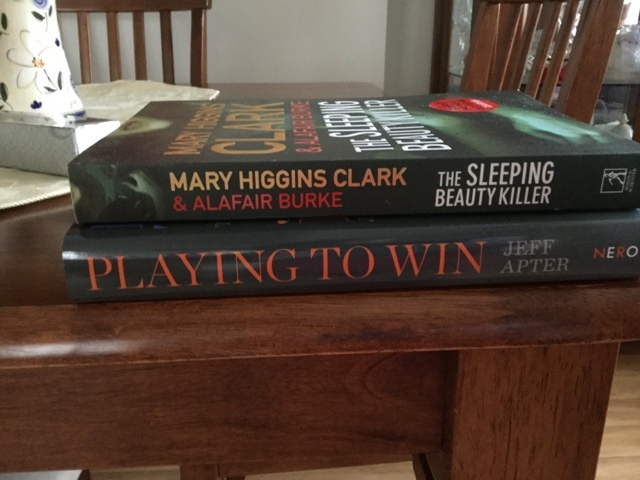 Since I posted about these two books I have read both, (now to add two new ones to the pile, lol). 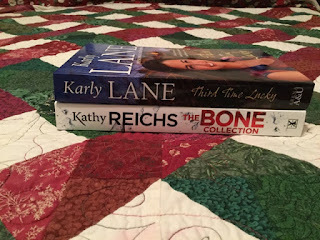 Kathy Reichs didn't disappoint with four gripping stories. Short and full of detail, with serious discussions in the first three, they are fantastic. Dealing with puppy mills, raptors, pythons, The Everglades and climbing deaths on Mt Everest make for interesting reads. The fourth story has me waiting for her next full novel to come out. While it is about how Tempe got into forensics, it is the ending that has the twist. Not telling, read the story. Karly Lane, new to me, I loved it. The blurb on the cover says A heartwarming novel about betrayal, ambition and the power of love. It is all that and more. I thought it was slow to start with and found her habit of slipping into the past strange BUT once I started I couldn't put it down. The trips into the past are as if the person was remembering and they added spice to the story. Again not telling, read it. Now is the time we are all looking forward to holidays, sun, surf and sand, so I thought why not look for a place to stay? Port Stephen's is a lovely holiday spot on the north coast of New South Wales, not a place I've been to, yet. I found this article extoling the wonders of Port Stephen's, as a place to holiday at in 1920. 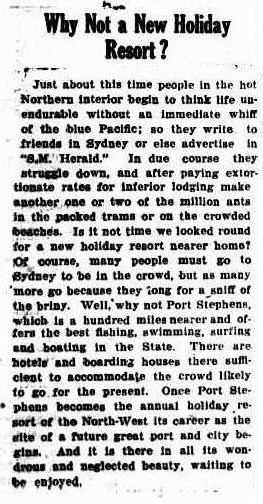 I love the comment about "another one or two million ants in the packed trams." What would the writer think of Sydney's trains, now? Not much has changed! Bye for now, Lilian. Do you have a favourite spot to read? On the beach? In a hammock, under shady trees? Somewhere cool? Or are you like me and will read anywhere? I have been known to read, standing up on a train, when in a past life I worked in the city. Reading is the icing on my day! Most of these ladies have Facebook pages and I will do * to indicate which ones do. These pages are worth looking at. First up is Nicki Edwards*. Nicki is a wife, mum of four and a critical care nurse, one busy lady. She writes medical rural romances, set in the fictional town of Birrangulla. Each of the four books is centred around a main character and they all interconnect, throughout the books. I don't want to give to much away as they are fantastic reads. My favourite has to be The Peppercorn Project and Isabelle Cassidy, a young widow. Set in Stony Creek, a town with empty houses and wanting families to fill them, this is a story of new beginnings and friendships.